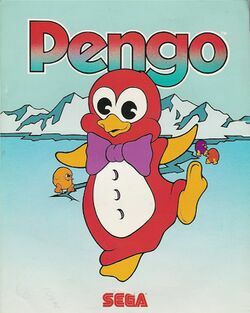 For the Sega Genesis game, see Pepenga Pengo. In the early 80s, Pac-Man ushered in the age of cute to arcades, and everyone was quick to jump on board. After publishing Frogger for Konami, Sega presented their own entry into the "cute" scene with Pengo, amid their more typical space-oriented games. Pengo's simple concept and sounds that provided as much cuteness as its visuals, was considered a mild hit. In Pengo, you must help a penguin who is trapped in a maze of ice blocks with a crew of deadly sno-bees. The sno-bees would love nothing better than to catch Pengo and kill him. Pengo has no physical means to defend himself, so he must use the only tool available to him: the ice blocks. Walking on ice (naturally), he can push the huge ice blocks around with relative ease. And if you time his shoves well, you can squash a sno-bee between two blocks of ice. Squash them all and you clear the level. Pengo borrowed another appealing feature from Pac-Man: intermissions. After every other stage, you would be presented with a different dance from a rainbow of penguins. Atari took the opportunity to license this game from Sega, and bring it home on their various systems. For whatever reason, they decided not to port it to any other systems through their Atari label, perhaps because they licensed the game so close to "the crash" of the video game market. Sega converted the game for play on the Game Gear. They also created an enhanced remake known as Pepenga Pengo for the Mega Drive, which contained the original arcade game. You control Pengo the penguin, and guide him in four different directions with the joystick. Pengo can push blocks of ice in any direction. If the block is clear on the other side, it will slide. If not, Pengo will crush the block. Sno-bees hatch from eggs frozen inside certain ice blocks. If they touch Pengo, Pengo will lose one life. 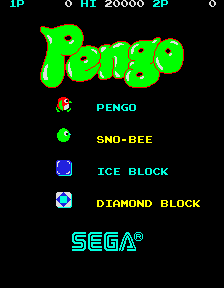 Pengo must destroy every Sno-bee on each stage, either by crushing the eggs before they hatch, or by squashing each one with a block of ice. A slight exception to this rule is that sometimes the last Sno-bee will move quickly to a wall, and then to a corner, where it shrinks to nothingness. Pengo can also push against the outer edge of the screen. Any sno-bee touching that edge will become stunned. Three blocks of ice appear each stage called diamond blocks. They can't be broken and if they are aligned, you will receive a big bonus. A time bonus is awarded at the end of each stage depending on how long it took you to complete the screen. This page was last edited on 16 February 2014, at 17:00. This page has been accessed 14,344 times.